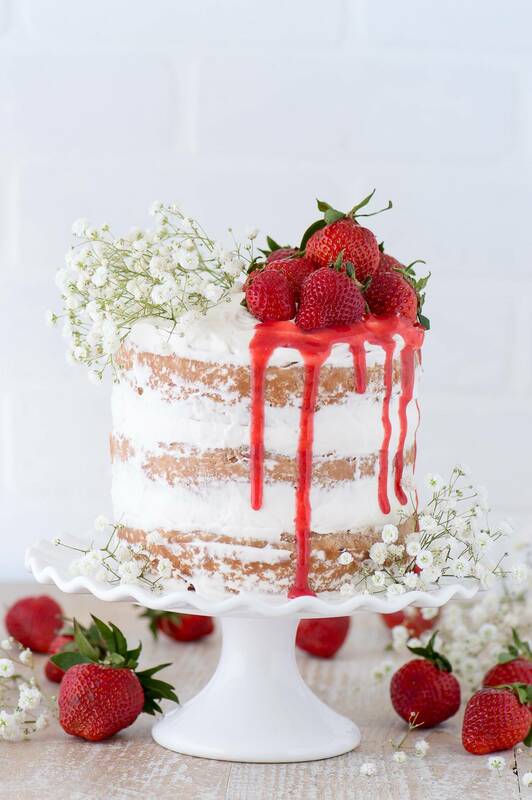 This strawberry naked cake is made with fresh pureed strawberries and is paired with homemade sweet cream whipped cream! Like a strawberries and cream cake! This is a real deal strawberry cake. That means it’s made with real strawberries! I sure wish it was as easy as throwing some strawberries and flour in a bowl and voila, it would magically make a cake. Haha, in my dreams! There is a little more effort required than that, but it is worth it. It’s a 2 bowl kind of recipe, one of the dry ingredients and one for the wet ingredients. The cake is really moist and has a nice sweet, strawberry flavor. But there is another star in this recipe .. the whipped cream! We could call it a “sweet vanilla oh my gosh this is the best homemade whipped cream ever”. 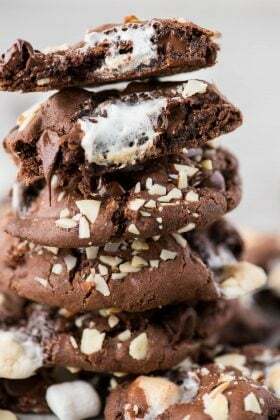 If you have a sweet tooth (guilty!) this homemade whipped cream would be perfect with angel food cake or for dipping fruit in. While pairing a whipped cream frosting with a traditional butter cake is not typical, I like that the lightness of the whipped cream balances out the sweetness of the cake. I think that using buttercream frosting could have made the cake overly sweet – unless it was a lemon buttercream or a cream cheese buttercream, those could add some nice tang! I love how delicate naked cakes look. They are suppose to be imperfect and of course I struggle with wanting to make them look perfect, haha! But I do think they are the easiest type of layered cake to make. Plus you can decorate them and then no one’s really looking at the frosting anyway! I baked this strawberry cake in three 6 inch springform pans. You could easily bake this cake in three 8 inch pans, the layers won’t be as thick, but it would still be perfect! 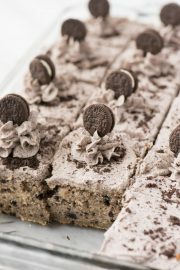 You could also bake this cake in a 9×13 inch pan, be sure to watch the baking time, could be between 27-40 minutes – huge estimate, haven’t tried it yet! 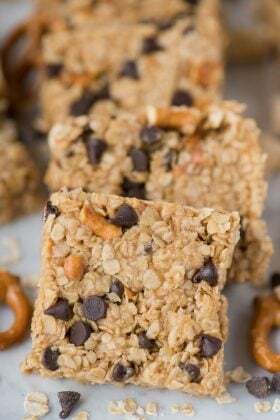 Visit the International Delight website for coupons and more recipe ideas. In a smaller bowl, combine the flour, baking powder, baking soda, and salt. Mix gently. Set aside. In a larger mixing bowl, beat the sugar and butter with an electric mixer until fluffy, 1-2 minutes. Add in the eggs, lightly beat with the mixer. Add in the pureed strawberries, mix with a spatula. In a separate bowl combine the yogurt and sweet cream creamer, mix with a spoon until you have watered down yogurt. Add this to the cake mixture, and mix with a spatula to combine. Gradually add in the flour mixture, mixing with a spatula until the flour is just incorporated. Using butter grease the bottom and sides of three 6 inch round cake pans or springform pans (you could also use two or three 8 inch round pans) and line the bottoms with a round piece of parchment paper. To ensure even baking, place a bake even strip around each pan. You can make your own homemade bake even strip by cutting a towel or shirt to fit the size of your pan. Get the fabric really wet, then squeeze out the dripping water but do not squeeze it too dry. 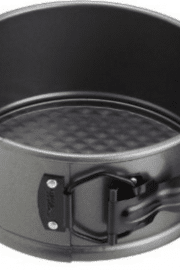 Secure the fabric around the pan with a safety pin. Divide the batter among the pans, if using three 6 inch pans, about 1 & 1/2 cups of batter will go in each pan. Bake for 36-42 minutes or until a toothpick inserted in the center comes out with minimal crumbs. If you’ll be assembling the cake later, wrap the cake layers really well in plastic wrap and place them in the refrigerator, they are good for up to one week like this. 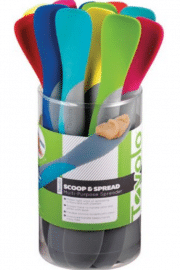 Be sure to place metal mixing bowl and beaters in freezer for 30 minutes before making the whipped cream. In small bowl, combine the 8 tsp of cold water with the 2 tsp of gelatin. Set aside and allow the gelatin to bloom. 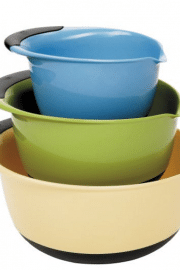 Remove the mixing bowl and beaters from the freezer. Add the heavy cream, sweet cream creamer, powdered sugar, and vanilla to the chilled bowl. Beat the mixture into soft peaks using an electric mixer. Could take 5+ minutes. Microwave the gelatin and water for 10 seconds, the mixture will now be liquid-y. Slowly add the gelatin to the whipped cream. Beat the mixture until stiff peaks form. Could take 4+ minutes. Spread a small amount of whipped cream on a 6 inch round cardboard cake circle. Place your first layer of cake on top of the cardboard. Fill a piping bag fit with a large round piping tip with a good amount of whipped cream. 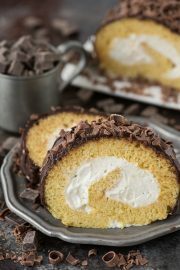 Pipe a generous amount of whipped cream on top of the first layer, covering the entire layer. Repeat this processor each layer of cake. 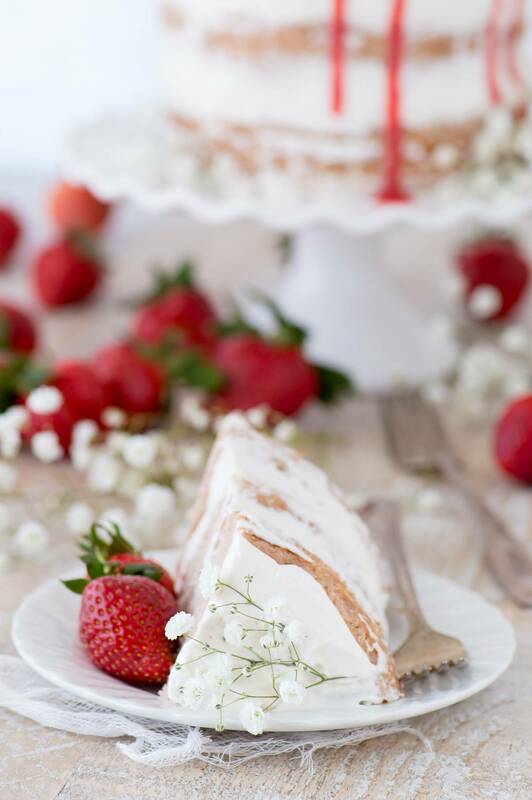 Once all of the layers and stacked, pipe a generous amount of whipped cream on top of the cake. 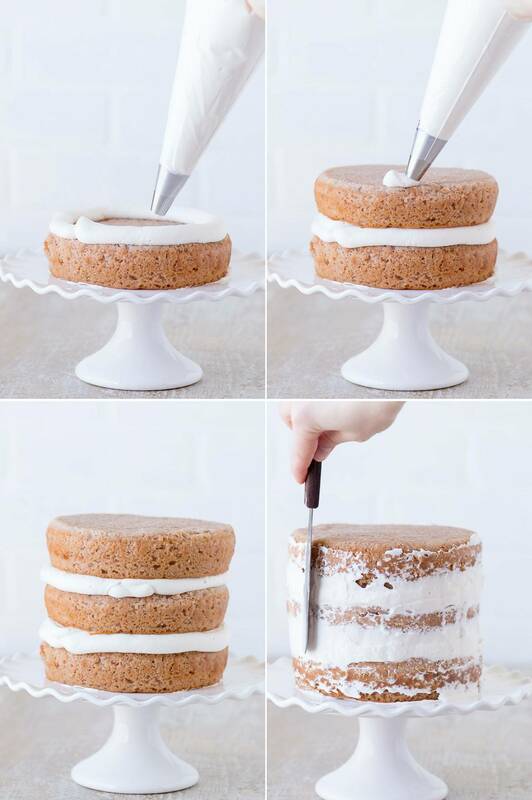 Next, use a small offset spatula to add a thin layer of whipped cream to the sides of the cake. Don’t completely cover the cake layers as they are suppose to still be visible. You can refrigerate the assembled cake for up to 3-5 hours loosely covered or serve immediately. Keeping the cake in the fridge for a longer amount of time is not recommended as the whipped cream will not hold up the best. 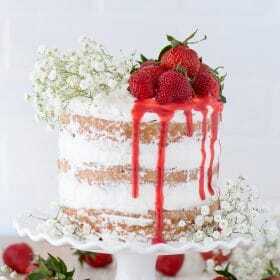 If desired before serving, decorate the cake with flowers, fresh strawberries and strawberry puree drizzle. Note: Because the cake is frosted with a whipped cream, some of the whipped cream may come out of the sides of the cake when cutting. If you’d prefer to pair this cake with a buttercream frosting, I’d recommend a vanilla buttercream. Dear Beth, what a gorgeous cake! I love the fresh strawberries and whipped cream combo. Like strawberry shortcake, but better! Oh wow, this cake is absolutely gorgeous! I just LOVE the look of naked cakes. That rustic imperfection is my idea of artistry! What an absolutely stunning cake! I love the strawberry drips on the side offset with the baby’s breathe! It’s gorgeous! I’ve been wanting to decorate a cake with flowers, it’s so pretty! 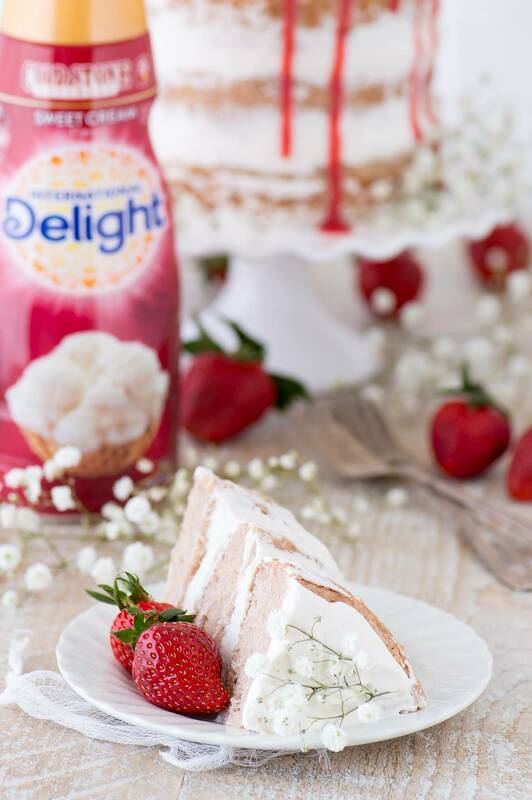 You had me at strawberries, but you sealed the deal with that frosting! Whipped cream frosting is the way to go! Going to have to try my hand at one of these- so gorgeous! Sounds pretty amazing, too! This is beautiful! 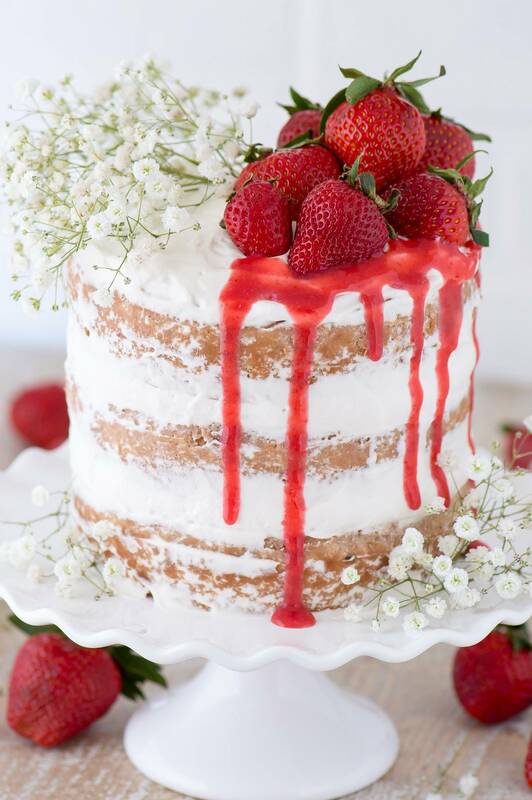 I love the naked cake look and you’ve nailed it :) I really like the way you’ve just got strawberry on one half of the cake, it’s a really lovely effect. Yum, Beth! This is so pretty and looks delicious! I love strawberry cake. It’s my favorite! A perfect flavor to have as your favorite! This looks and sounds incredible. Love the strawberries on top … and drizzling down! This cake is absolutely fantastic! 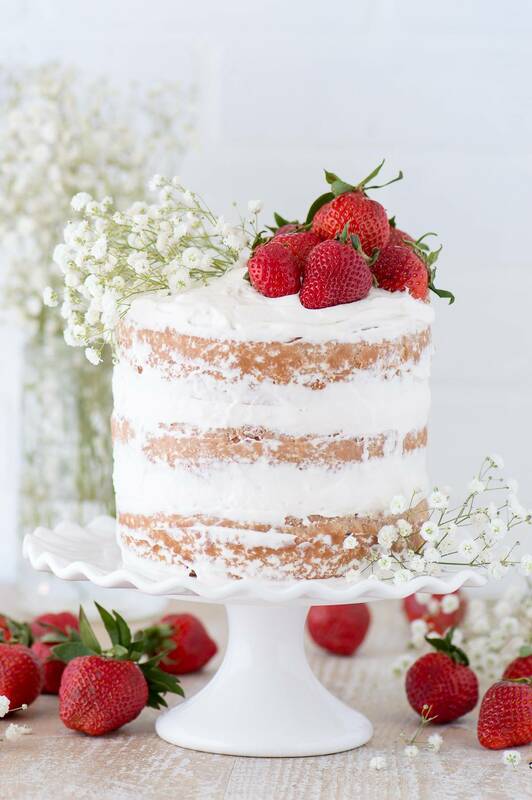 This cake is stunning beyond belief, and I am basically obsessed with naked cakes lately! Gorgeous, lady! You should make one, I want to see it!! Fresh for spring to mix it up! What a gorgeous cake! I adore homemade whipped cream and your version sounds delicious. It could be the best part of the cake! Oh gosh, you are so sweet!! So, so, so pretty! I’m in love! This looks perfect! I love that you use real strawberries. I don’t mind a little extra dishes if I’m going to make a cake that looks this good! Haha yes! It’s a special weekend cake perhaps! I just love how easy and simple this cake is and how beautifully it comes together! I’m definitely going to make this! Not too much work with a big pay off! This cake is just stunning Beth! I am SO into everything strawberry right now – can’t wait to try this! Thanks for your sweet comment Trish, I am so glad it’s finally strawberry season! love naked cakes. So beautiful! 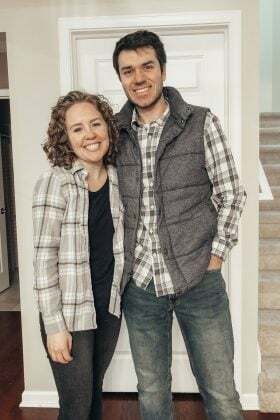 I love the looks of them too!! Hello friend, how grams is the one stick butter? This cake is beautiful!! Would it make a really big difference if I just used all regular cream and omitted the International delight? 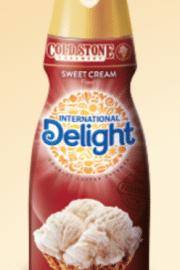 The International Delight creamer adds great flavor, but heavy cream would serve the same function. Thanks for sharing this recipe! 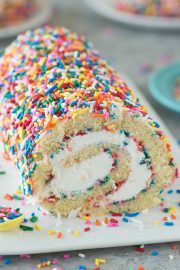 Have you made this cake in a 8 inch or 10 inch size? I would like to make it for a party. Hi Kandace! I haven’t but if you double the recipe, that should make enough batter for a 8 or 10 inch layered cake. This cake looks beautiful. I wanted to use the frosting for my daughter’s birthday cake. I just made it, and it turned back into cream after I added the gelatin. What did I do wrong? 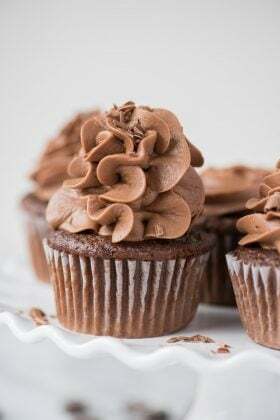 Have you ever used this recipe for cupcakes? If so , how many does one recipe yield? Also, I would like to pipe the whipped cream into roses on the cupcakes, do you think your whipped cream recipe will hold the shape? I used this recipe for a baby shower, It was a 12″, 4 layer cake, with white chocolate and whipped cream between the layers. I love your easy to follow instruction! Going to try it out for my daughter birthday! Can we use something other than delight creamer….heavy cream???? Yes! I would suggest milk. Hi Angie! I would do 1 & 1/2 times the recipe in order to have enough batter to fill three 9 inch pans! I’m looking at the comments for suggestions… But has anyone actually tried to make this cake? I have been beating for almost 30 minutes to be exact measurements of the frosting and followed each detailed step-by-step, but I am nowhere near stiff peaks. Hi Jenny! Did you freeze your metal bowl and beaters before making the whipped cream? 30 minutes is way too long, maybe you over-beat it and now it won’t form stiff peaks. Have you made whipped cream before?